Army helicopter pilot Matthew Lourey, the son of state Sen. Becky Lourey, was killed in Iraq, becoming the 22nd Minnesotan to die in the Mideast during the Iraq war. St. Paul, Minn. — Becky Lourey, her husband Gene, and family members learned Friday morning that the helicopter reported lost in Iraq Thursday was piloted by their son and brother, Matt. The Army has said two soldiers were killed when a helicopter was shot down and crashed Thursday in central Iraq, about 35 miles north of Baghdad. It hasn't been confirmed that it was Lourey's helicopter. Matthew Lourey flew Kiowa Warrior helicopters with the Army's 82nd Airborne Division. Tony Lourey, Matthew's younger brother, heard about the downed helicopter Thursday. It was a Kiowa -- the kind Tony knew his brother was flying. "It came across the wires that two were involved in an incident and one went down," said Tony Lourey. "But we convinced ourselves that it wasn't him, and got a good night's sleep, but found out it was." Matthew was one of 12 brothers and sisters raised by Becky and Gene Lourey on a farm near the small town of Kerrick, about 50 miles south of Duluth. Lourey graduated from Askov High School and joined the Marines, said his sister-in-law, Marlana Benzie-Lourey, Tony's wife. When he didn't get a chance to fly for the Marines, he got out and trained as a private bush pilot in Ely before joining the Army as an officer. She said he had flown Kiowa reconnaissance helicopters for years in Bosnia and other places before going to Iraq. "We were just hoping when it was a Kiowa that went down, maybe it wasn't Matt," she said. "He was just really confident and good at what he did." Matt Lourey's parents, most of his siblings and other relatives gathered Friday in Kerrick. "Everybody just misses him terribly," Benzie-Lourey said. Tony Lourey remembers his older brother from better times. And he remembers his dedication to the Army. "Matt was just a fun-loving guy. Never took things too seriously on the face of it," Tony Lourey said. "But he was always thinking, and trying to do what was right. A kid at heart all his life." Another tragic example of the price that people pay for the duty and honor of our country's request of them. As a state, our thoughts and prayers are with the Lourey family at a very, very trying time. Tony Lourey says Matthew didn't have to be in Iraq. "He was over there once already, and actually had the opportunity to not go back. And nobody could talk him into taking the reassignment that would have kept him at home," said Tony Lourey. "He was wanting to go protect his brothers in arms. And that was his choice. It was honorable. He didn't believe in the cause, and neither to I. But he believed in his guys, and he went over to do what he can." Senate Majority Leader Dean Johnson said he was notified of Lourey's death Friday morning by a military official and was asked to give word to Sen. Lourey at the Capitol. Lourey had already learned the news from a daughter and left abruptly for home. Johnson, a chaplain and brigadier general in the Minnesota National Guard, says Becky Lourey worried about her son, and often prayed with Johnson for Matthew's safety. "Every time a helicopter crash would occur, Becky would come to see me. And we would talk, and pray, and were hopeful that it was not her son," said Johnson. Friday morning, it was other members of the Senate praying for Becky Lourey and her family. "After a very brief time of session this morning, we huddled, we prayed, we cried, thinking of our colleague, Senator Becky Lourey," said Johnson. Johnson says Lourey told him about Matthew's love for what he was doing. "She said as a child, he would play with helicopters, and always told his mom and dad he wanted to fly helicopters. And so, let's just say he died ... living out his childhood dream," said Johnson. State Rep. Bill Hilty, a Democrat from Finlayson who represents half of Lourey's Senate district in the House, is a close friend and colleague of Sen. Lourey. Hilty says Becky Lourey worried about her son. "It was a constant concern for her. She had mentioned to me on more than one occasion, that she paid attention to the news every day," Hilty said. "Always sure every parent has in the back of their mind that today could be the day." Gov. Pawlenty paid tribute to the soldier in his weekly radio address Friday. "Obviously our hearts and prayers and sympathy go out to Senator Lourey and her family," he said. "Another tragic example of the price that people pay for the duty and honor of our country's request of them. As a state, our thoughts and prayers are with this family at a very, very trying time." The Loureys have lost two other sons over the years. Jay died years ago at the age of 5 from complications of heart surgery. Fernando died in a diving accident at a hotel swimming pool in 2001. 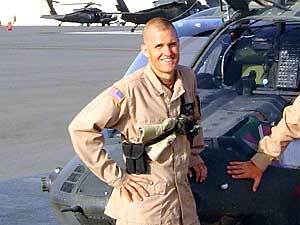 Matthew Lourey is the 22nd Minnesotan to die in the Mideast since the Iraq war began. A spokeswoman for the U.S. Department of Defense declined to comment. The department typically releases information on military deaths one day after family members have been notified.